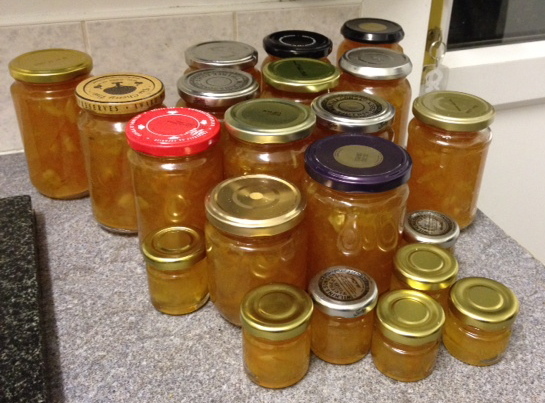 Just made a batch of marmalade. Seville oranges are only available at this time of year. This is the recipe I used. Wash and dry the fruit. Cut fruits in half and squeeze out the juice. Tie the pips in a piece of muslin. Cut the peel into thin slices – very therapeutic! Put the peel, juice, pips and water in a large pan and cook gently for about 2 hours until the peel is soft and the liquid has reduced by about half. Warm the sterilised jars on a low light in the oven. Remove the bag of pips and squeeze the juice out onto the pan. Bring the pan to the boil, take off the heat, and stir in the sugar until it has dissolved. Boil rapidly until setting point is reached – it took me about 10 minutes. Pour the marmalade into the jars using a small jug – fill to the top. Either cover immediately with waxed circles, or screw on sterilised lids and turn the jars upside down on a cooling tray. This will create a seal. Spread on toast, use in bread and butter pudding, bake into scones, use in marinades, drizzle over cake, eat with cheese. This entry was posted in Recipes and tagged marmalade. Bookmark the permalink.